Parking ticket, contest or not? Posted: 15:25 - 08 Nov 2018 Post subject: Parking ticket, contest or not? My wife has just text saying she's got a parking ticket at a hospital car park. 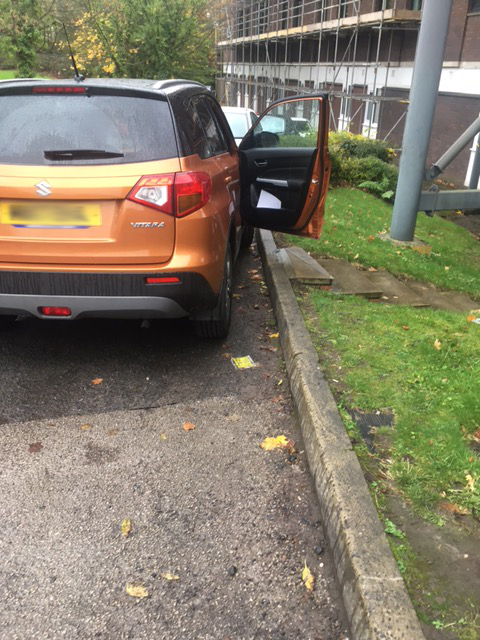 She's spoken to a colleague who's given her a number to call for a contact at the hospital / parking company (presuming it's private) who's said the issue is that she was blocking some stairs. You'd possibly not even see the steps if you were parking the other way round. I'll get more details including exact wording / company that's issued the ticket later but would be interested in people's opinions on if they can ticket or not. Contest it. She has nothing to lose. My cars better than yours btw. Completely understand that blocking pathways etc shouldn't be done, these stairs are essentially an access to a maintenance shed, not an escape route. In other parts of the hospital grounds the bays aren't actually marked and parking on access roads etc is fair game where there are no yellow lines so I doubt it's that she's not in a bay. indeed, I don't own a car. I've posted the same on pepipoo but it appears to be a slower forum so no replies as yet. If the general thought is "you could try, but it's likely they'll tell you to cough up" then might as well pay the reduced rate rather than risk forgetting to do it until the deadline passes. Wait for replies on pepipoo before paying up. How much is it? £100 > £60 down here is still a rip'. Absolutely, if it was "important", there'd be signage, hand rails on the steps, yellow cross-hatching on the road, all sorts. IMHO it's taking the piss to give a ticket for this. If there's no signage anywhere around specifying that you can't park across those steps, I wouldn't even think about paying it. I had a similar problem at a place I used to work. A parking enforcement company approached the company and said they would manage the parking in the company car park for free. We were in a big industrial estate with Auto Trader and a couple of other big businesses. The auto trader people were always parking in our car park. The board of directors approved this company coming in. Big mistake. They ticketed anyone and everyone. If your permit was partially hidden, you get a ticket. If you had one wheel touching the line, you were ticketed. If you parked blocking in other people (which is OK as we knew who had which car and we did it all the time up until the parking enforcement started) you were ticketed. The fine was £80 and there was no appeal. Once they started, the contract was ongoing and couldn't be cancelled. If this hospital has done the same, you're probably in the doo-doo because there is literally nothing you can do about it. You can't even appeal on the basis that you work there, because these bloodsuckers don't care. we don't work there, was attending a meeting there. the printed reason on the ticket is "causing an obstruction" which is a very nice vague catch-all really isn't it? Oh, always worth a go. I once accidentally parked in a poorly marked hospital staff carpark, and wrote in (politely) to the parking vultures with very little hope - however they actually waived it.